North Adams is home to Williams College and the Massachusetts Museum of Contemporary Art (MASS MoCA) which is one of the cultural gems of Western MA. After a day taking in the art at MASS MoCA I recommend you fill up on Korean food at the nearby Korean Garden. The restaurant is in a squat bunker-like building that previously hosted a red-sauce Italian restaurant and then a Mexican restaurant. The decor from the Mexican Restaurant is still partially in place, so Korean Garden has an odd look going on. In addition to classics from Korean cuisine, they have the usual pan-Asian menu options; sushi, tempura, pad thai, udon, fried rice and teriyaki. I tried the Oshitashi, cooked spinach with sesame dressing, but it was ultra salty and I couldn’t eat more than a bite or two. 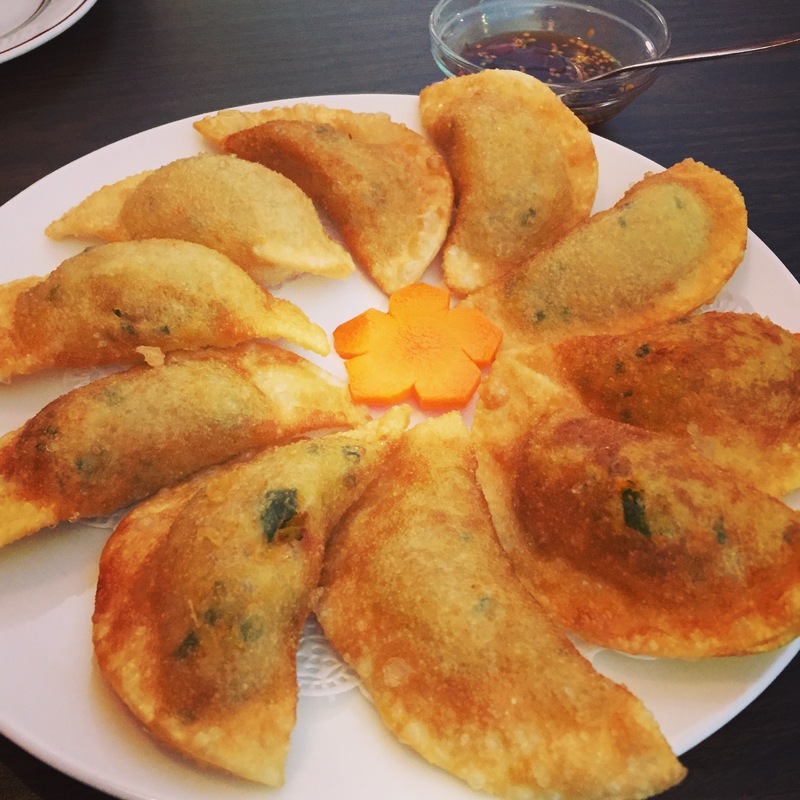 The Dumplings: Korean Garden has Shumai and meat or vegetable filled mandoo that are prepared either steamed or fried. 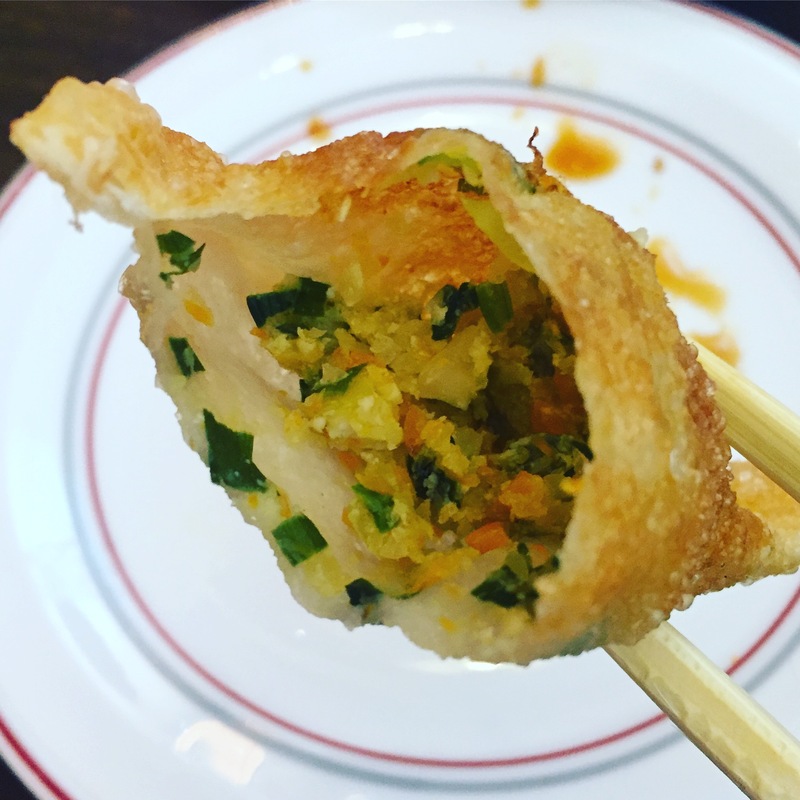 We tried the fried vegetable ones which are filled with tofu, onions, scallions and Korean leeks. The mandoo were deep fried and had puffed up like balloons so there was a lot of air inside the dumpling wrapper. The effect was like simultaneously eating a potato chip (the crispy wrapper that had ballooned out and was not in contact with the filling) and a dumpling. As you would expect the filling had slightly sweet, sauteed onion/leek flavor that I enjoyed a lot. The full order has 10 mandoo and these dumplings are vegan. The Dipping Sauce: The mandoo come with a slightly spicy Korean style dipping sauce flavored with sesame oil. The Location: Korean Garden is at 139 Ashland St in North Adams right next to the campus of the Massachusetts College of Liberal Arts about a 5 minute drive from MASS MoCA. This entry was posted in Korean, Mandoo, Vegan, Vegetarian. Bookmark the permalink.